Bratz has overtaken Barbie in many parts of the world as the number one selling fashion doll. Following in Barbie's footsteps, the Bratz line includes much more than just the dolls alone. They also produce playsets, outfits, a clothing line for girls, DVDs, video games, movies, and a 2015 stop-motion web series. The dolls have even won several toy industry awards including Character Brand License of the Year from Licensing Industry Merchandisers Association (LIMA), as well as several Toy of the Year and other awards from Family Fun and the Toy Industry Association (TIA). Bratz are available in nearly 70 countries worldwide. Bratz dolls began production in the summer of 2001, and they are produced by MGA Entertainment. The original Bratz line included several multi-ethnic characters, including Cloe, Sasha, Jade, and Yasmin. They have combable, rooted hair for play value. The dolls have very over-sized heads which help them resemble some of the big-head, big-eye dolls of the 1960s such as Blythe. The dolls are also known for having fun, detailed accessories and play sets which reflect their cool (and somewhat materialistic) lifestyle. Playsets depicting discos, karaoke, and sushi bars, salons and spas, limousines, retro cafes, and malls are all available. Bratz dolls are 10 inches in height, but much more "chunky" to the feel than Barbie dolls which are 11.5 inches in height. There is also a pocket-sized "mini Bratz" doll available. A taller version of the dolls was produced in 2013 and 2014. The size returned to 10 inches in 2015 but with a new body and head mold. These received negative feedback. Bratz dolls are made of two types of vinyl: hard vinyl for the head and body with softer, bendable vinyl for the arms and legs. Bratz dolls also have a unique feature that when you change their shoes, you actually change their feet. The shoes and feet pop off as one. This obviously isn't very realistic, but it is fun for play and it does solve the problem of tiny doll shoes being vacuumed up all over the house. Bratz dolls are somewhat controversial because of their heavy diva-like makeup and their oh-I'm-so-bored attitude expressions. Many mothers have also objected to the skimpy and overly "fashionista" outfits. Other mothers are simply so happy to have their 9- to 12-year-old daughters still playing with dolls that they happily overlook those aspects of the doll. The brand went through a lot of production halts, relaunches, and rebranding in the 2010s. The change in the body style of the dolls in 2013 resulted in a significant drop in sales. Mattel (producer of Barbie) and MGA Entertainment were involved in lawsuits for over a decade as to whether Bratz creator Carter Bryant was working for Mattel when he developed Bratz. With several reversals through 2013, the litigation may continue for many years. 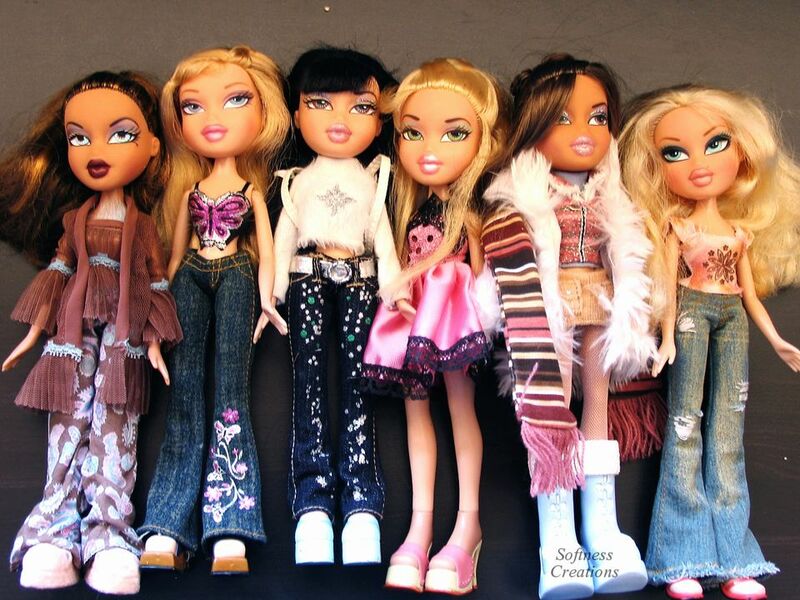 Following the success of the original Bratz dolls, two spin-off doll lines were created. Bratz Babyz featured the original characters as babies and Bratz Kidz which were six inches tall and shorter proportioned versions of the originals. The Babyz line was criticized by parents for being overly sexualized. The Big Babyz line specifically came under fire for coming with a garment that strongly resembled a thong which the company maintained was meant to keep the dolls skirts from riding up. Other parents found the Babyz Night Out fashion set and Brattoo Parlor playset to be inappropriate for a baby doll. Bratz Boyz Kids were produced in 2007 with four dolls. The Be-Bratz line in 2007 included a USB key to use to give the doll an online social profile and to play online games. The Bratzillaz witch-like Bratz were introduced in 2012.